Asking $68.00 -- MUST SELL -- Make me an Offer !! (Item should not be shipped, but that's up to Buyer, Seller not responsible for damage in transit). Buyer to pay U.S. Shipping, or item can be picked up. Cash or Money Order only. Working, Electric -- Carron Manufacturing Company -- Model 1000 Acoustical Phonograph. Front Carron Plate says 117V 25 60 Cycles, 25 Watts. Bottom has 4 Rubber Feet & is stamped with packing/transport information & how to set up phonograph to play. Carron Mfg. Co., Chicago, IL, 1959, AC only, 110 Volts. 60 Cycles. Measures approx. 13 x 9 x 6-1/2 inches. Some scuffs to paint, etc. 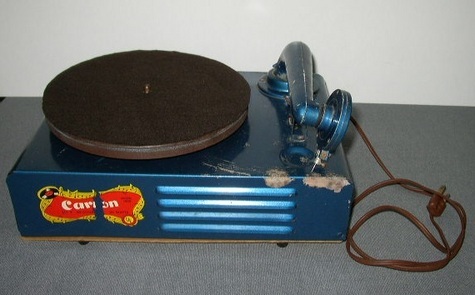 due to age, & Turntable has brown felt over it, but can be removed. Comes with Needle. Tested with a Record & it played just fine !